Eileen Elliott believes in the transportive power of a terrific wine. When the beverage director at Somerville’s Tasting Counter presents an aromatic white called “Champetre,” from biodynamic Distillerie Artisanale Cazottes, she can’t contain her enthusiasm. “I feel like I’m in the southwest of France, standing in an orchard in spring,” she declares, saying it offers “broad acidity” and flavors of “tart white cherry.” Made from the mauzac grape, it pairs delightfully with a dish of sablefish from chef-owner Peter Ungar. 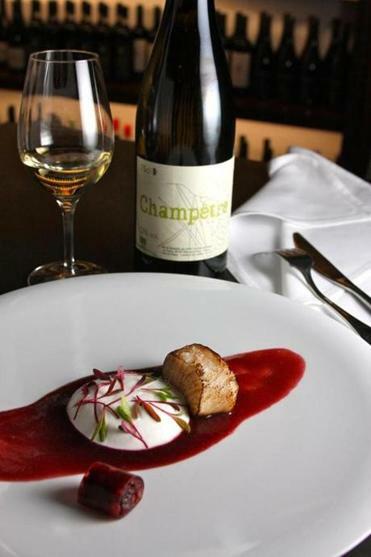 The fish is plated with a dollop of house-made yogurt on a lacto-fermented cherry sauce. Alongside is a cylinder of cherry compote around which is wrapped a gel made of rice wine, crafted by Dovetail Sake in Waltham. Partake of this pairing as part of a set tasting menu (dinner $165-$180 all inclusive). At this 20-seat spot, you pre-purchase a ticket online, choose your style of beverage, then slip into a counter seat, ready to banter with the chef and his team as they plate nine splendid courses for you. It’s a sojourn worth the splurge.